Designers Michael Ostrow and Roger Stoker, with their chocolate lab Gracie in tow, split their time between Los Angeles and Palm Springs, with showrooms for their design business, Grace Home Furnishings, in each city. 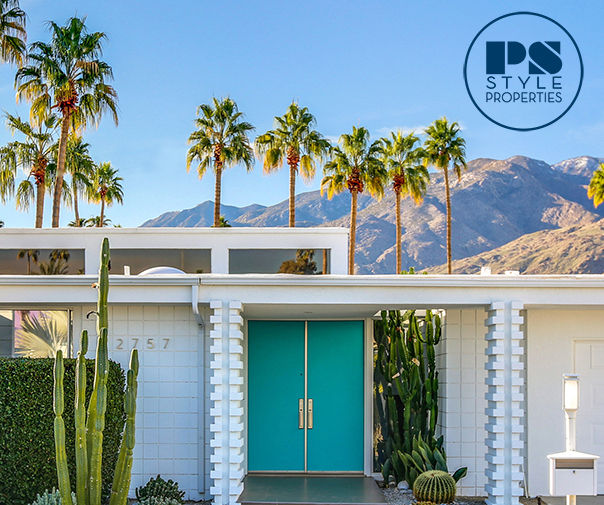 Their Los Angeles home is a 1958 Hollywood Regency property reflecting the style of John Elgin Woolf, but they traded a mansard roof for clean lines and modern style when they purchased their 1975 Stan Sackley residence in the Indian Canyons neighborhood of Palm Springs. Sackley is described by Ostrow and Stoker as an architect who left a great body of work following his death in 2001, but has remained underappreciated until recent years. Fans of the home’s brilliant mountain views and stylish architectural details, including high ceilings, clerestory windows and walls of glass, Ostrow and Stoker purchased the home in 2012, and did not need to make any immediate structural changes. Instead, the duo set forth in refreshing the interiors by way of updated wallcoverings, furnishings and light fixtures. 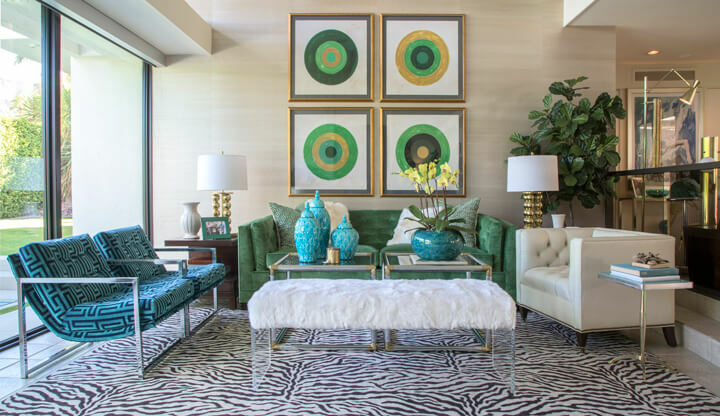 Much of the home’s furnishings were designed by the couple as part of their Grace Home Collection© of furniture and fabric, like the green velvet “Liza” sofa in the living room, with low, sleek lines that complement the architecture. Artwork in the family room is actually stretched panels of vintage fabric purchased by the duo at the Palm Springs Modernism Show & Sale years ago. Unsure at the time how they would use the fabric, a light bulb went off when they bought the house and saw the high ceilings, realizing that framing the fabric as “art” would work perfectly in the room. The fabric’s blue, green and yellow hues with black and white accents ultimately served as the inspiration for the home’s overall color palette. The couple’s favorite room is the combination living room and media room, separated by Sackley’s signature see-through fireplace with stacked stone detail. The home’s expansive formal entryway and dining area lead to a step down into the living and media room, with walls of glass all along the back of the house, opening out to the pool and views of the San Jacinto mountains. The home’s custom glazed floor tiles are believed to have been designed for the house by the architect, and the original cabinetry and tile remain in one bathroom. The remaining bathrooms and kitchen are slated for an update by Stoker and Ostrow, who plan to implement changes that are sensitive to the original Sackley design. Above: The home’s pool is accented by a duo of floating swans named Abelard and Eloise, whose threatening demeanor keeps ducks away! Love the grace stores, dog and michael and roger! Everything they touch is done with grace and elegance…. Back in Houston for now but hope to see you next time in PSP – April or May. PS – love the cabinet next to the vintage chrome rocker. Awesome home, and nice guys….